Ok so we started this blog because of a challenge we set ourselves to go the cinema once a week for a year no matter what! Now there are a few obstacles, or to put another way, head wrecking elements to this challenge. The two main ones being cost and the lack of good films we often have to choose from. These two head wrecks are also interconnected because of the fact of paying to see films we did not particularly want to see e.g Week 12 – 50 Shades of Grey and Week 25 – San Andreas. Nevertheless, overall the experience so far has been enjoyable but this week has been especially gratifying. What was even more encouraging was, if it were not for this challenge we would unlikely have visited an old school vintage cinema like we did. Even though we were in England for a bit, due to our commitment to the challenge we were still going to go to the cinema. While in London last week it was pretty easy to find a cinema, but when we moved on to Folkestone we had to do a little digging to find out where it was, times etc (and when I say digging I really mean go on the internet for all of 5 minutes - oh the woes of this tech age) and what we found was a little gem. The Silver Screen Cinema is a two screen independent cinema that gave me the feeling that I was stepping back in time, from the old style sweet counter to the red curtain that draped over the smallish screen. To the black and white pictures hanging in the actual screening room from classic films like The General (1926) and also of some of cinema’s pioneers like Charlie Chaplin, Humphrey Bogart and Greta Garbo. It was refreshing to visit a cinema of vintage style instead of the replicated Cineplex’s that are ubiquitous, the Odeon in Putney (where we saw Amy the previous week) is no different to the IMC Galway or Cineworld on Parnell Street Dublin. 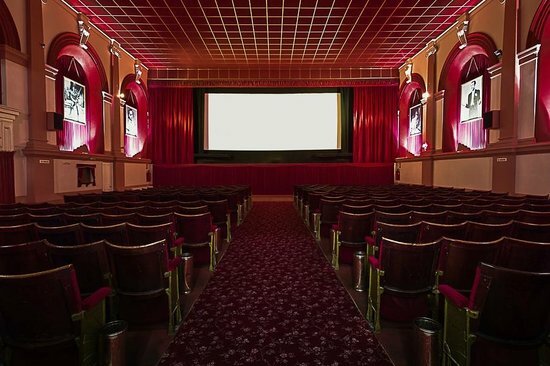 The Silver Screen in Folkestone is the opposite of those, it has character and that extensively adds to the cinema going experience. It was a buzz to feel what it must have felt like for cinema goers in the early days when there was no sound, no colour, no Netflix or torrents when going to cinema was a big event. Ok maybe I am going too far, but for some of you who read this you will know what I mean. The cinema of which I put some pictures up below is able to survive due to local community support and long may it last. Now to add flavour to the treat of going to this cinema, the film we watched was made in the very place where we were sitting because Everyone's Going to Die was shot entirely in Folkestone. It is the story of two people who randomly meet, connect and help each other realise that they have to make changes to their lives, both realising that they have been unhappy for some time. Written and directed by Jones, which as far as I can find out is a collective of filmmakers that are anonymous. The title at first led us to think that it was some sort of apocalyptic horror or comedy horror but it was nowhere near any of these, indeed it is very hard to actually describe what this film is. At times it is laugh loud funny, it’s also romantic and very dark, but for all the elements it has I think it was relatively well kept together structural and narratively. Everyone’s Going to Die is a pretty decent film and it will get you talking after it, but I am afraid this week the film was definitely upstaged by the cinema we watched in. So if you ever find yourself in Folkestone go to the Silver Screen Cinema.